Participating in a delegation to London, which was led and initiated by the Zalul Organization in cooperation with and sponsored by the British Embassy in Israel, were representatives from the Ministry of Environmental Protection, local government, industrialists, plastic manufacturers, startups that are developing plastic alternatives, and representatives from environmental groups. The purpose of the trip was to bridge the tremendous gaps in information that exist between Israel and Great Britain, which is considered to be a world leader on the subject, and to generate cross-sector partnerships in Israel between the different stakeholders engaged in this sphere. During the visit the delegation met with government representatives from the Ministry of Environmental Protection, Agriculture and Rural Development, with the Ministry of the Economy and the Israel Innovation Authority, with leaders from the Association for Bio-degradable Tableware and with a leading expert on sustainability in sports, all of which enriched and enlightened us on teaching the public about different behavior, without preaching about changing behaviors. The delegation visited a supermarket where the use of plastic is negligible, and which is working on becoming completely plastic-free. It was amazing to see how every possible item was sold there while admirably safeguarding the environment – from vegetables and fruit to water sold in cans instead of bottles, to deodorants and laundry detergent in cardboard boxes. In addition, the delegation learned about a major campaign being conducted in England against soft drinks companies, demanding that they reduce the use of plastic bottles and calling on the public to change their habits, and more. The main conclusion of the delegation’s participants is that plastic recycling is far from being a solution. There were even those who say that it is a kind of fraud, because it involves transporting single-use plastic waste to other countries (in our case, to Turkey that allows treatment in a way that causes tremendous pollution and would never receive environmental approval in Israel), which ultimately comes back to us, and thus causes air and water pollution from the ships sailing back and forth. Products that are made from recycled plastic are used, for the most part, only once or twice more. These products actually end up as another type of product, of lesser quality. This means that our waste travels around the world while causing a great deal of unnecessary pollution, primarily to make people feel good by letting them think they are dealing with their plastic waste, when in reality this is not the case. Nevertheless, it is still important to recycle plastic! First of all, in order to remove it from the primary waste cycle because our landfill sites are full. Furthermore, it is possible to use them to make benches, chairs and other products. And most of all, by collecting and separating plastic waste we are illustrating to those in charge of the environmental sphere that there is a large sector of the public for whom this is an important issue and who expect the authorities to handle everything differently. The second conclusion drawn by the delegation is that even in when it comes to biodegradables, there are no good solutions. The alternatives presently available to disposable plastics are made from organic materials – cellulose, sugar cane, potatoes, corn, food waste and other materials and more. But – and this is a big but – they cannot be thrown into the garbage together with plastics; they need to be composted. Most of the biodegradable products are used to cover and preserve food, and often they get soiled from the food and people don’t bother to clean them. What we learned is that the best thing to do is actually to recycle our organic waste, that is, our food waste. And this can be recycled together with the alternative tableware that is made from plant-based materials. Israel lags way behind, and currently there is a national program to reduce the use of disposable plastics and packaging. We hope the goals that are set will be high so as to line up with what is happening in the rest of the world. There is no doubt that this is an ambitious goal and a huge challenge for Israel, but for this there is a very active civil society that takes this subject seriously. And we will help them. 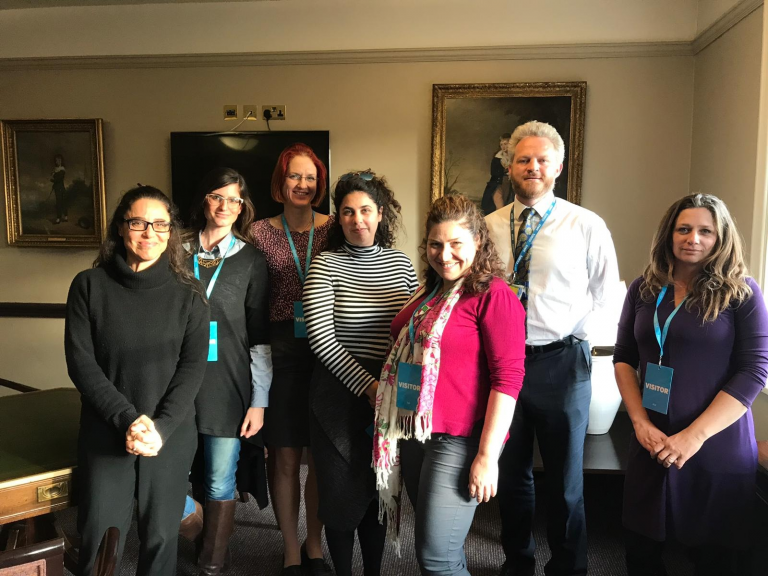 We are very grateful to the British Embassy in Israel for enabling us to learn about this subject firsthand, and to continue leading the revolution to reduce the use of single-use plastic in Israel.